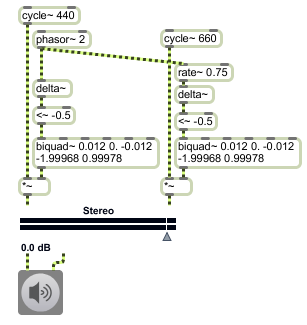 The live.gain~ object is a slider that scales input audio signals and provides a visual indication of the current sound level on a deciBel scale. bang Sends the current value out the outlet. The number received in the inlet sets the level (in dB). The word assign, followed by a floating point value, causes that value to be stored and displayed and sent out the live.gain~ object's outlet. If the Parameter Visibility attribute is set to Stored Only, the assign message will not add the new value to the Live application’s undo chain. init Restore and output the initial value. (mouse) Click and drag the slider to change the amplification. Hold down the Command key (Macintosh) or the Control key (Windows) for more precise mouse control. outputvalue Sends the current value out the outlet. Sets the current value without causing output. signal In left inlet: The input signal (left channel) to be scaled. In right inlet: The input signal (right channel) to be scaled. A raw normalized value (between 0. and 1.) received in the inlet is converted to a real value, stored, displayed by live.gain~ object, and the current value is sent out the outlet. def. :1 Toggles the object's active mode. When the active attribute is set to 0, mouse action does not cause output and the inactive colors are used. def.:-70. 6. Sets the range, in deciBels, displayed by the live.gain~ object. By default, the the display range is set to the same values as the range of the object itself (-70dB - +6dB). focusbordercolor float Sets the display color for the live.gain~ object's border in RGBA format. def.:10. Sets the ramp time in milliseconds. The default is 10 milliseconds. def. :20 Sets the update time interval of the meter display, in milliseconds. The minimum update interval is 10 milliseconds, the maximum is 2 seconds. This message also sets the rate at which the live.gain~ object sends out the list of peak values (in dB) for each channel received in that time interval. def. :1 Specifies whether the live.gain~ object displays and outputs the signal level pre-fader (0) or post-fader (1). modulationcolor float Sets the modulation color of live.gain~ object in RGBA format. def. :0 Sets the slider object to a horizontal or vertical data display. 0 Automatic: (the default) sets the display dependent on the size of the slider - longest side of the rectangle that describes the slider sets the orientation. 0 relative mode: In relative mode (the default), the live.gain~ keeps its relative position when you click on it. Moving the mouse outputs higher or lower values in relation to that relative position. 1 absolute mode: In absolute mode, the live.gain~ will automatically jump directly to the clicked location. def. :1 Toggles the display of the parameter name. The default is 1 (on). def. :1 Toggles the display of the gain parameter value. The default is 1 (on). slidercolor float Sets the slider background color in RGBA format. textcolor float Sets the display color for the live.gain~ object's text in RGBA format. tribordercolor float Sets the triangle border color in RGBA format. This is only used when the live.gain~ object does not have the focus. tricolor float Sets the triangle color in RGBA format. This is only used when the live.gain~ object does not have the focus. trioncolor float Sets the triangle color in RGBA format. This is only used when the live.gain~ object does have the focus. float: Out third outlet: The current slider value in dB, when dragging on the slider with the mouse or when live.gain~ receives an int or float. Out fourth outlet: When an output is triggered, a raw normalized value (between 0. and 1.) is sent out this outlet. list: Out fifth outlet: The amplitude of the two channels (in dB) is sent out this outlet. signal: Out first and second outlet: The input signal, scaled by the current slider value.